No, it is not a psychology term as in “I think you need to face your inner monkey in the closet. And it isn’t a summer replacement show in the NBC lineup, with the smart-alec neighbor monkey with a catch-phrase. It seems to be an elusive part of American folk lore/culture. Part of my family’s lore is the story of the monkey in the closet. My mother has said my aunts and uncles tell about seeing a monkey in the bedroom closet at my grandparent’s house when they were growing up. According to the kids, this particular bedroom had a closet with a door that did not fully close. At night, they swear they would see a monkey in the closet. Even some of the older kids claimed to have seen the monkey. So I am watching Family Guy and the middle kid Chris has a character named “Evil Monkey that lives in the closet”. The monkey menaces Chris with an angry teeth gritting point wordlessly telling Chris, “I am going to get you”. I thought, “That’s odd. There is an evil monkey in our family too”. So then I talked to a guy at work who also was afraid that an evil monkey would get him when he was a kid. Now wait a minute. How can this be? I had a very vivid imagination as a kid and I never saw an evil monkey in the closet. 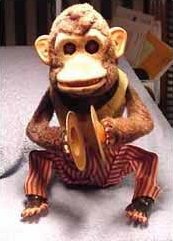 Although I was kind of freaked out by those cymbal playing mechanical monkeys. Those are just plain freaky, maybe they are too close to clowns, which terrify me. So I am thinking, is this one of those shared memory deals? I think this is worth exploring. Seriously. If I get any kind of response generated from this, I will post a whole new evil monkey page. Email your stories, comments, experiences to evilmonkey@daveobrien.com and I will post them to the evil monkey page.